This item is licensed under a Creative Commons Attribution-NonCommercial-ShareAlike (CC BY-NC-SA 3.0) license. 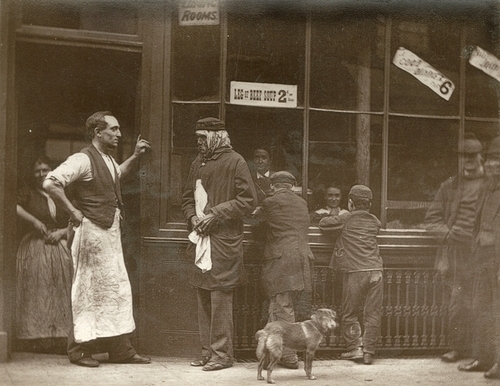 John Thomson & Adolphe Smith, 1877, Street Life in London, (London: Sampson Low, Marston, Searle and Rivington). "In Drury Lane there is a house which has been celebrated for more than a century. It was a "cook-shop" in Jack Sheppard’s time. This notorious criminal often dined there, and it is now still frequented by hungry convicts or ticket-of-leave men, who find kindly welcome and may, If they choose, receive wholesome advice from the owner of this strange establishment."